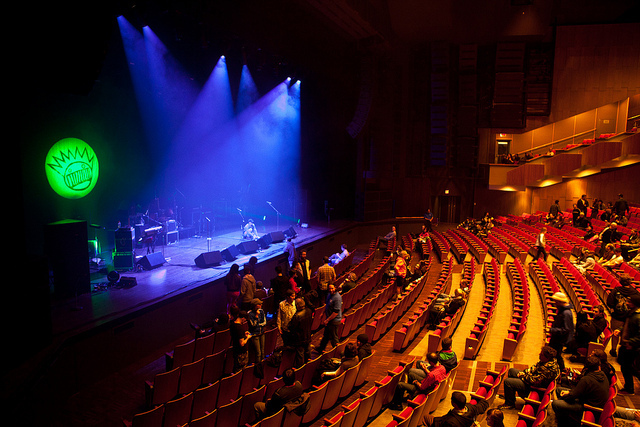 The Queen Elizabeth Theatre is located in downtown Vancouver, Canada, it is the premier performing arts venue in the area. The theatre can seat up to 2,929, with Mezzanine, balcony and orchestral seating areas. Its great location enables patrons to access the venue from all surrounding areas, and is home to the Vancouver Opera and Ballet BC. The theatre was the first project by the Montreal-based architectural partnership Affleck, Desbarats, Dimakopoulos, Lebensold, Sise. It opened in July, 1959. Due to its central location the theatre’s parking options are limited, Parking is available at the Queen Elizabeth Theatre parkade, beneath the theatre itself. The entrance is off of Cambie Street between West Georgia and Dunsmuir Streets. Parking is limited, so arrive early. Accessible parking options are available at the Queen Elizabeth Theatre parkade, call 604-665-2193 during the week to reserve your accessible parking. All children of any age are required to have a valid ticket whilst attending performances.